How to Get the Best Possible Mortgage. Before you take on the largest debt you'll ever have, you should have more - and better - information than you've ever had before. Whether you are a novice or an expert real estate investor this book provides the information you need to finally understand what lending channel, what loan product, and what price point truly fits your need. If you are an engineer looking to dig deeply into the nuts and bolts of how this works you will love the tools and analyses in this book. If you are more interested in just drilling in and getting quick answers, this book is an excellent reference guide with easy-to-find, high quality advice. In order to get the best mortgage possible you need to do five things very well: 1 - Decide whether you should even get a loan in the first place 2 - Choose the best lending channel for your needs 3 - Choose the best loan program for your needs 4 - Choose the best price point for your specific plans 5 - Lock your interest rate at the right time The Loan Guide provides a complete guide to doing all these things well. Finally, The Loan Guide covers how to manage your mortgage in order to keep as much money in your pocket over the course of your lifetime, how to interpret and avoid common marketing gimmicks, and how to use the Excel-based analytical tools used in examples throughout the book. Since 2008 all the rules of lending have changed. 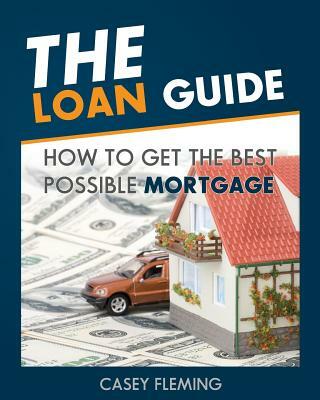 The Loan Guide, published in 2014, was written between 2008 and 2014 and updated as it was being written, to reflect the most current rules and guidelines possible. The Loan Guide is current, clear and complete, and you will find it answers exactly the questions you have, and many that you should have but don't know it. Casey Fleming began his career in the mortgage industry in 1979 as an appraiser. He founded and built one of the largest appraisal firms in the San Francisco Bay Area, earned the highest appraiser designation in California, and testified as an expert witness in court. In 1995 he began his transition to mortgage lending. Since then he has helped hundreds of families and investors finance their homes or investment properties, recruited hundreds of mortgage originators, produced several hundred training and professional development meetings, and has been published in major industry trade magazines. Casey has always been most passionate about one thing: thoughtful, intelligent analysis of the central questions about lending. His clients include many Silicon Valley engineers, so this focus has served his clients' needs perfectly. This experience has been poured into The Loan Guide. Today Casey still originates mortgage loans; his blog is located at www.loanguide.com.